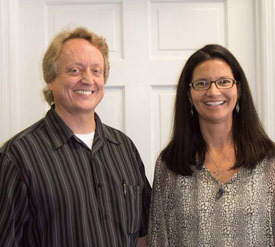 Dr. Vince and Dr. Elise are ready to help YOU! For Madison chiropractic patients – and their families – who want better health and better energy for a better life, Madison Family Chiropractors is the answer. Helping you and your family achieve your highest health potentials is what our Madison chiropractors are all about! Helping every member of the family, from newborns to centenarians, live healthier lives is our passion. Give Madison Family Chiropractors a call today to schedule an appointment and take the first steps on your path to true wellness with our chiropractors Madison. Dr. Vince is the man! My first visit was wonderful! I feel like my sinus cavity has really opened up after suffering from sinus/allergy issues for quite sometime. My shoulder has felt a little weak lately and after my first adjustment, my down dog in yoga was much stronger! Thank you, Elise! I’m a true believer of chiropractics now! Very pleasant visit. Dr. Vince made my experience very relaxing and easy. Very relaxed atmosphere and Dr. Vince takes quality time with you. The Happy Feet session made a difference. Much less pain the day after a round of golf. Hopefully will be able to tell more tomorrow, however it was very different than any other chiropractic facility I have been to and I’ve been to many. Overall very open to further sessions with Dr.Vince. Dr. Campbell is a highly-venerated citizen of Madison. He has been here for many years, and has helped thousands of our citizens attain better health. I actually enjoy seeing the staff and visiting with my friends in the waiting room for the few minutes before I am called in for treatment. New to chiropractic; Dr Vince has done a wonderful job of introducing me to a helpful way to eliminate back pain. Excellent experience. Will continue with hopes of improved health and relief from pain. Dr. Vince and staff are the best people to work with. You cannot find anyone any better. Highly recommend using Dr. Vince for your chiropractor needs! First time and I am truly amazed at the results! I thought that Dr. Vince was the bomb. I had my neck adjusted like never before. He is a good guy, too. Dr. Vince does listen and he understands that after an accident, people are a little more tender and sore than usual, and he allows for this is his adjustments, and I never once felt uncomfortable or tense, waiting for the adjustment to be attempted. Nice visit………..look forward to using other services. Without the help of y’all I would still be in a lot of pain! Thank you! I didn’t expect to come in and walk out without the pain. I expected the pain to be less with each visit and it is. I’m very satisfied by the treatment I’m getting from Dr. Vince.